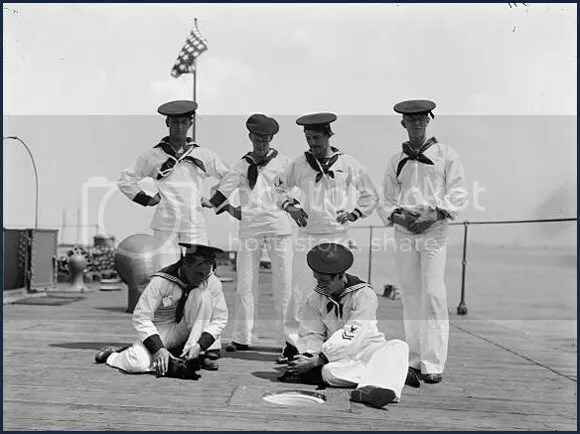 Sailors and cats have a special relationship that dates back thousands of years. It is likely that the ancient Egyptians were the first seafarers to realize the true value of having cats as shipmates. In addition to offering sailors much needed companionship on long voyages, cats provided protection by ridding ships of vermin. 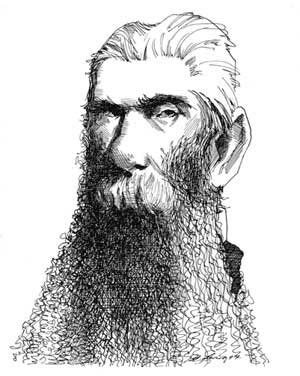 Without the presence of cats, a crew might find their ship overrun with rats and mice that would eat into the provisions, chew through ropes and spread disease. The more superstitious sailors believed that cats protected them by bringing good luck. 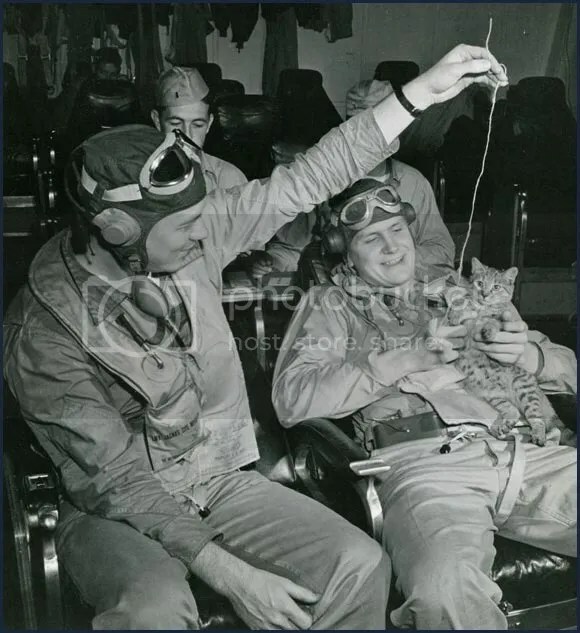 It was also common for crews to adopt cats from the foreign lands they visited to serve as souvenirs as well as reminders of their pets at home. Apprentices aboard the USS Pensacola pose with mascot cat and dogs in February 1888. The Pensacola was a screw steamer that participated in Admiral David Farragut’s capture of New Orleans in 1862. 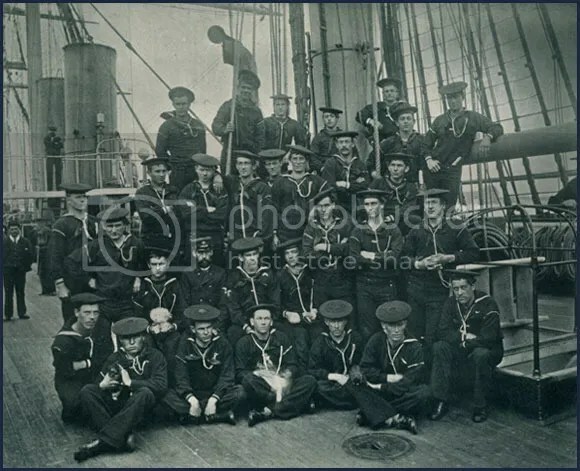 Crew of the USS Nahant with their two cats, ca 1898. The Nahant was an ironclad monitor that joined the fleet of Rear Admiral Samual Francis du Pont (for whom Washington, DC’s Dupont Circle in named) in the attack on Charleston Harbor in 1863. 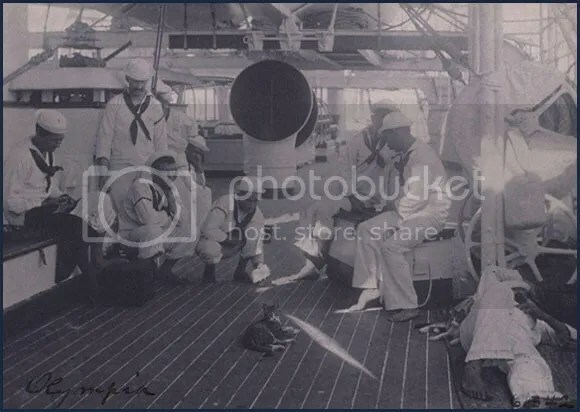 Crewmen on the deck of the USS Olympia using a mirror to play with their cats in 1898. The Olympia served as Admiral George Dewey’s flagship at the Battle of Manila during the Spanish American War. The Olympia currently is docked in Philadelphia and is the world’s oldest floating steel warship, but is in desperate need of restoration. 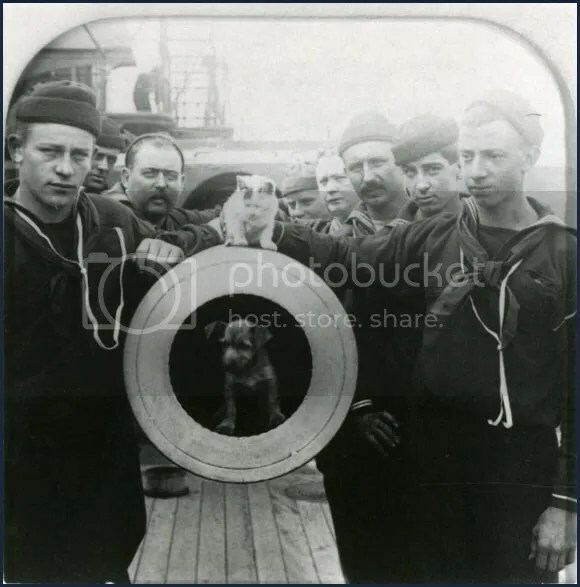 Crewmen of the USS Texas pose with mascot dog and cat on the muzzle of one of the ship’s 12″/35 guns, ca 1900. Built in 1892, the Texas was the first U.S. battleship and gained a reputation for being jinxed because of a series of accidents. The crew probably hoped the cat and dog would change the ship’s luck. 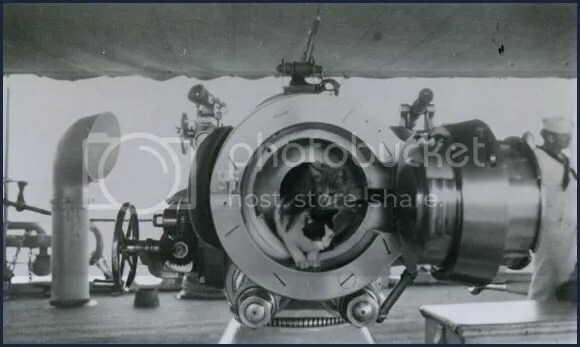 “You may fire when ready, Muffin.” Two cats pose in the breech of a 4″ caliber naval gun of an unidentified ship prior to World War One. 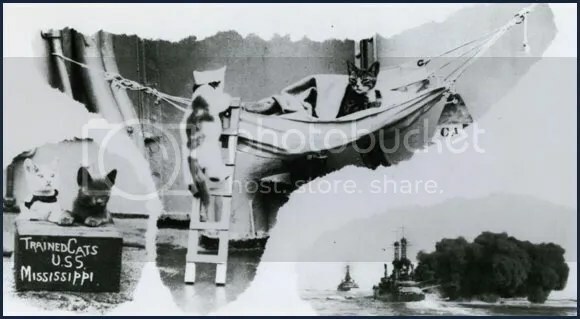 “I’ll be in my bunk.” The cats of the USS Mississippi climb ladders to enter their hammock, ca 1925. The Mississippi was involved in several fierce battles in the Pacific during World War Two and was hit by kamikazes twice. It survived to be among the ships in Tokyo Bay that witnessed Japan’s surrender. 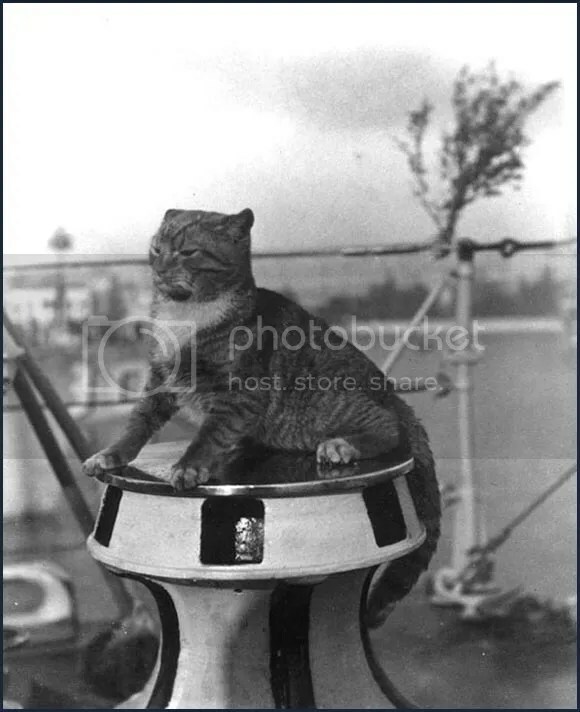 “Do not want!” USS Flusser cat ‘Wockle’ on the capstan in Venice, Italy, 1924–25. “Waiting instructions in the briefing room, pilots on a US Navy aircraft carrier relax by playing with the ship’s mascot. Shortly after this picture was taken they were flying far above the Atlantic on a battle-mission.” Probably the USS Ranger, July 1944. “Why don’t you leave me alone so I can get some shut eye?” New mascot ‘Saipan’ of the USS New Mexico tries to get comfortable. 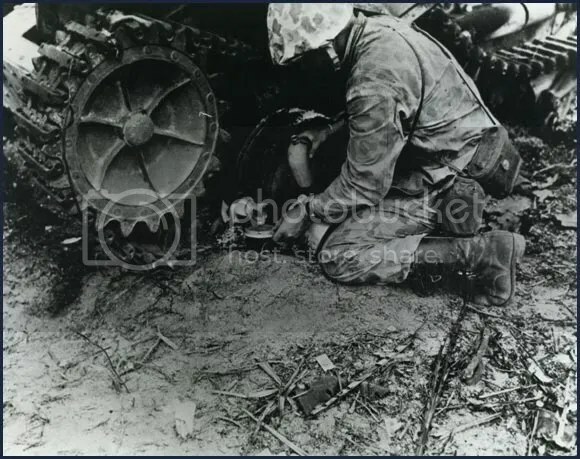 The New Mexico provided support during the U.S. Marine invasion of Saipan in 1944, so it is likely the cat was rescued after the battle. 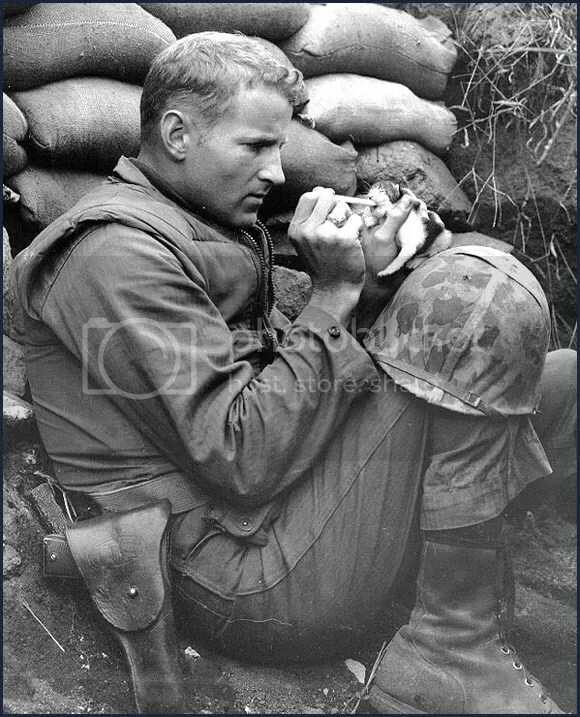 “After the smoke of battle had cleared on Betio Island, Tarawa, this tiny kitten crept out from beneath a wrecked Japanese tank, to receive a drink from a U.S. Marine.” Tawara Invasion, November 1943. Here is ‘Bilgewater’, the mascot of the Coast Guard Academy, circa 1944. He’s modeling the new wartime grey cadet uniform. War Veteran ‘Pooli’, who rates three service ribbons and four battle stars, shows she can still get into her old uniform as she prepares to celebrate her 15th birthday. 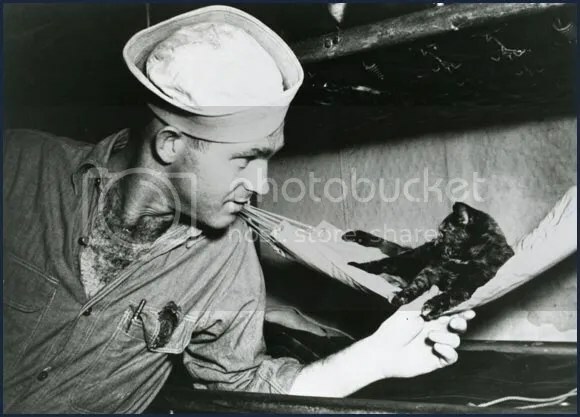 The cat served aboard an attack transport during World War II. Los Angeles, 1959. 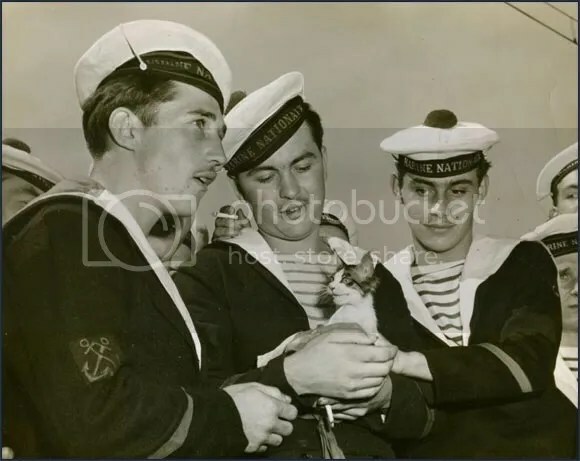 “I demand your terms of surrender!” French sailors play with a cat as they wait to take over six LSSLs (Landing Ship Support, Light) being given to France by the US Navy under the defense aid pact. Seattle, 1950. Accepting her fate as an orphan of war, ‘Miss Hap’ a two-week old Korean kitten chows down on canned milk, piped to her by medicine dropper with the help of Marine Sergeant Frank Praytor. The Marine adopted the kitten after its mother was killed by a mortar barrage near Bunker Hill. The name, Miss Hap, Sergeant Praytor explained, was given to the kitten “because she was born at the wrong place at the wrong time”. Korea, ca 1953. 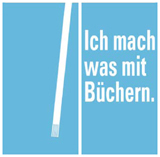 All text and images: U.S. 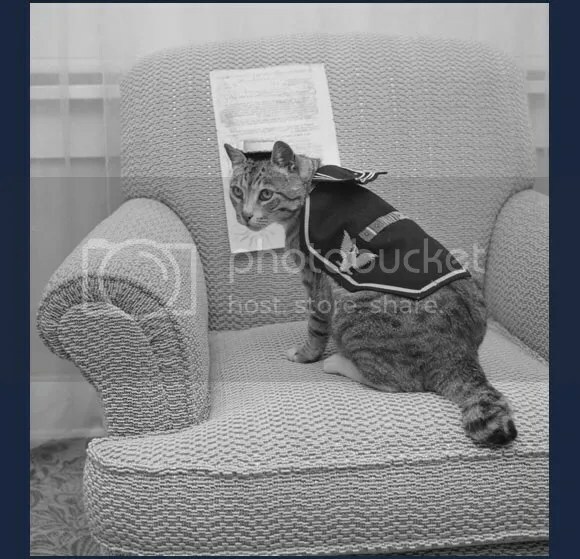 Naval Institute: Cats in the Sea Services. 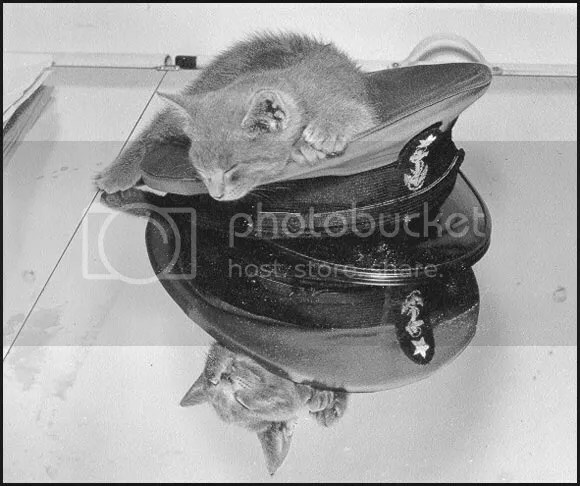 See also: Purr ‘n’ Fur: Cats in Wartime at Sea!